Chad Michael Murray signs an autograph for Mady Loiacano, one of the many fans who came to see him in Eastern Hills Mall on Friday. 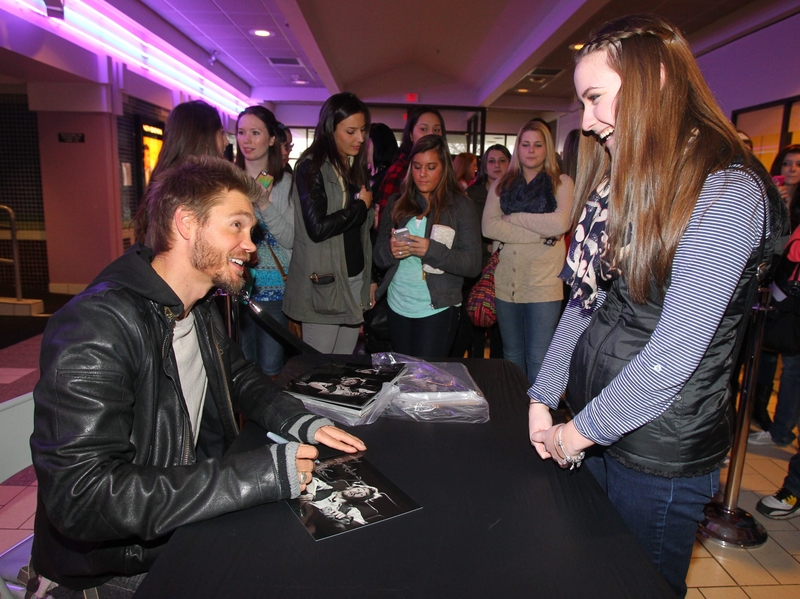 Chad Michael Murray returned to Buffalo on Friday to sign autographs, pose for pictures and screen a new film. He loves Western New York. He loves it so much, in fact, that the Hollywood actor and TV star said he is even thinking of moving back to the Buffalo area for good. “The Buffalo area is just fantastic,” said Murray, a Buffalo native and 1999 graduate of Clarence High School. Murray’s affection was returned by the scores of fans who waited in line – some of them for an hour and a half – to spend a few moments with the star. Murray made an afternoon appearance in Eastern Hills Mall, where he spent a few hours signing autographs and posing for pictures with fans. The line for autographs – which cost fans $20, and also got them a photo op with Murray – stretched down one side aisle of the mall. A portion of the proceeds from the signing session was to be donated to Hunter’s Hope, Murray’s publicist said. Then, there was an evening screening scheduled of Murray’s new movie, “Cavemen,” in the mall cinema. After that, the actor – whose credits include the television show “One Tree Hill” – was scheduled to attend a party in a Transit Road restaurant. Members of Murray’s family, who turned out for the autograph session, said they were thrilled to see the people in attendance at the event. The actor called it a little bit of a full circle moment for him – since, he said, as a teenager he worked at a theater there. Murray said in a phone interview earlier in the day with The Buffalo News that over the past year or so he has started thinking about moving back to the Buffalo area as a permanent home. “To have my home base here I think is great,” said the California-based actor. “I miss home. I miss being here, being able to go see the games, the Bills and the Sabres. The last time Murray was in the Buffalo area for a public event was a book-signing at a local Barnes and Noble, his publicist said. The line of fans Friday waited in polite, if high-spirited, quiet – broken every now and then by shrieks and screams. Some of those who attended said that Murray’s local roots are a big part of his appeal. “He’s from around here,” said Lexie Aquino, 20. “He seems like he likes Buffalo.